I was working to finish the restoration of a 1960s crystal chandelier for a repeat client. It needed to be in a box tomorrow morning for FedEx. While working, Stevie cat sauntered across my desk and bonked against my chest. This, as he recently taught me, was the signal that he wanted my lap. Being a obliging sort, feline-wise, I pushed my chair back a bit, and he stepped down to the warmth of my lap. I stroked his fur, he purred, and I resumed working on the fixture. A while later Spot appeared on my desk. I was agog. Spot is one of three furry beasts I have been letting into the house at night after my beloved Gilda departed for Florida last year. Spot is incredibly skittish and has never visited the office much less been on my desk. I froze. I was afraid to even breathe lest she bolt. Then an extraordinary thing happened. Spot walked over to me and pushed her head against my chest. !!!!!!!!!!!!!!!!!!!!!!! As my lap was already occupied, I opened my arms to her. She stepped in. !!!!!!!!!!!!!!!!!!!!!!! And all work came to a halt. You know, I can work with a cat in my lap. But a cat in my arms, too? My abilities have limits. Although typing with one hand, it seems, is doable. 23 Responses to Attacked! By Furry Beasts! I love reading about the house. But I live for posts about kitties. Golly! I will have to do more kitty posts! I don’t think anyone here will argue with more kitty posts! Spot is such a pretty girl. My parents have a kitty that looks like her, also very sweet. Ross, I think they just know that you’re a good guy. Love. 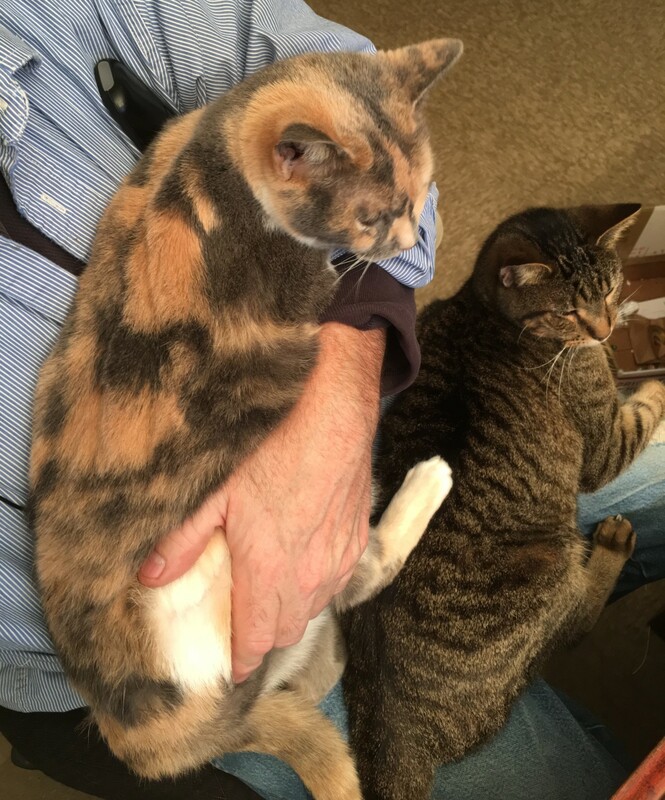 Every once in awhile my work is paused by needy loving cats. Sometimes you just gotta stop and snuggle. Yes!!! Big win! That’s one heck of an honor in my book. I love this breaking cat news. Great job multi-tasking your post too! This post made my morning! Thank you, Ross!! After Gilda’s departure the house felt so…dead. Even though Gilda slept 99% of the time I was always aware of her presence. About two weeks after Gilda left I started letting Stevie in during the evening. Then a bit later Fine and Spot. All three were born outside and have always been outside. Did they even know what a litter box was? EEK! They proved to all be smart kitties. And it’s nice having furry presences again in the house. Yes. Dead exactly how our house seems. We somehow can’t make ourselves seek out other cats yet. The three we’ve had over the course of our 34 year marriage “found us” and we’re so wonderful, smart and well behaved. We worry we might not be so lucky. And after 17 and 19 years with Henry and Scooter, we are still mourning. It’s especially hard to come home to an empty house after a trip. Maybe in a few months time we will be ready. I have an orange kitty that I have been feeding outside my front door for a few years. He won’t let me touch him and always runs when I get my hands near him. If I stand up straight and stay still, he will get very close and even rollover on his back by my feet. Last night, I was outside putting food out for him and he walked a little too close, so I reached out and pet the top of his back. He didn’t run! Not sure if this will be repeated, or he was simply too focused on the food I was putting down to notice what had just occurred. I fed a stray for year and was never able to touch her. Then one day, while she was eating, I gently dragged my hand along her tail. She started to bolt, but then, to my astonishment, came to me and dragged her body against my legs. And I dragged my hand again along her tail. She then dropped down in front of me and onto her back. I reached down and stroked her white furry belly. She purred. And from that moment on she LOVED being petted. It was a highly spontaneous post! So, I am glad it has been well received! And I did get the light finished and boxed this morning!